ABOVE: La Bella Vita arrives in Zelo, Italy. INSET BELOW: A stern view of the ship, the sun deck in Venice's Marittima cruise basin, the stairway to La Bella Vita's staterooms, engineer Roger Pagnin deploying the gangway, and the barge's original name on the bow. Unlike most of its peers in France and Britain, La Bella Vita looks more like a ship than a barge, with three decks (including a full sun deck) and a bridge or wheelhouse behind the bow. With a maximum capacity of 20 passengers, it's also larger than the typical eight- to 12-passenger hotel barge. During our cruise, we appreciated the large sun deck (which offers plenty of room for sitting, walking, and picture-taking) and the sheltered open-air side decks (where passengers can enjoy fresh air on rainy days). If you've cruised on river ships but are new to barges, La Bella Vita's layout will seem familar--albeit much smaller than on a full-size river vessel. A stairway in the reception foyer leads down to the lower deck, which has has eight standard staterooms, a galley, and more crew quarters aft. For disembarkation and embarkation, or for going ashore, La Bella Vita has a metal gangway with rope railings that's similar to the gangways on larger river ships. For more details, see the official La Bella Vita Deckplan. Accessibility: During our cruise, one of the passengers used a cane, and he had no trouble getting about (or off and on) the ship. 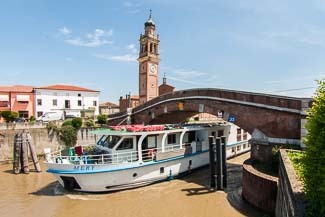 However, European Waterways is quick to point out that La Bella Vita has "restricted facilities for passengers with mobility issues." The barge doesn't have an elevator, and the gangway is too narrow for wheelchairs. 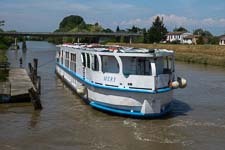 Superstition trivia: The name "Mery" is still on the barge's bow. When we asked the captain why, he explained: It's bad luck to change a ship's name unless you keep the original ship's bell. Mery didn't have a bell, so the name on the bow was left intact, and the barge's new name--La Bella Vita--is on a banner tied to a railing on the sun deck.